I am typing on my little iPhone in front of a little a diner in a little town called Austin*, Nevada. Today we biked 70 miles and climbed ’bout 3000 feet. The week has been great! Since last time, we biked over the sierras (except for a 40 mi hitch hike which we won’t talk about), made our way into Nevada, stayed with some wonderful people through a bike tour website called warmshowers.org (yes–even you can host cyclists like us in your cozy homes), and did some city park camping. We are well on our way, have met some mighty friendly Americans, and are stoked to keep going. After a rain just outside Carson City, NV. Grapes! 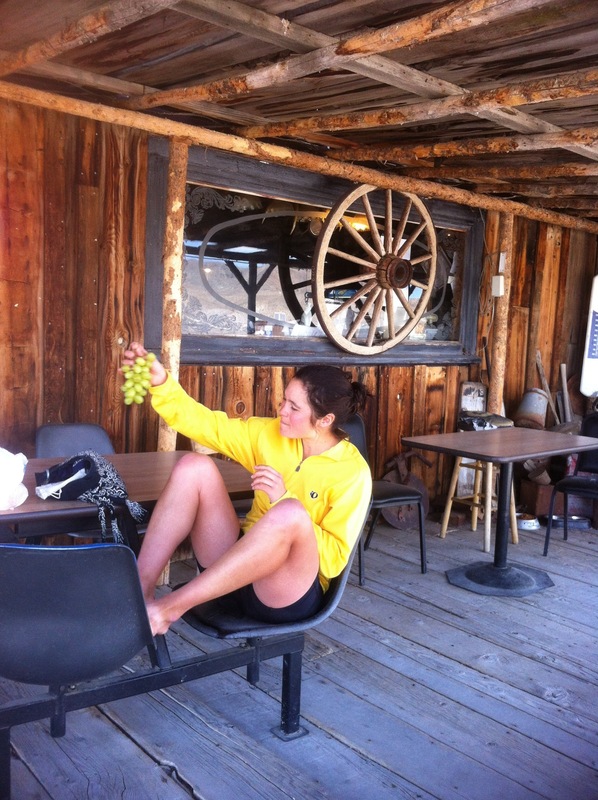 It was a nice rest stop at the Middlegate Station–which breaks up the 106 miles between Fallon and Austin. *Correction: I meant Eureka, Nevada. We biked from Austin that morning. Today Owen and I climbed 2000 feet and rode about 60 miles from Sacramento to Placerville. 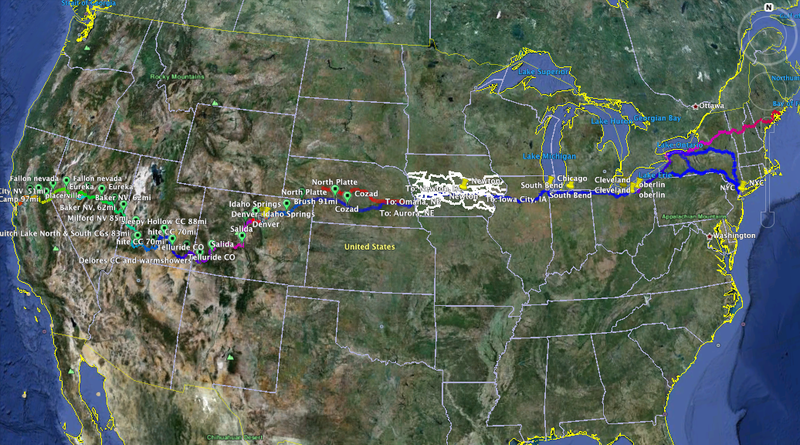 Tomorrow and the next day we’ve got some major climbing as we go over The Sierras. Oh, menstrual cups, the things I do for you. 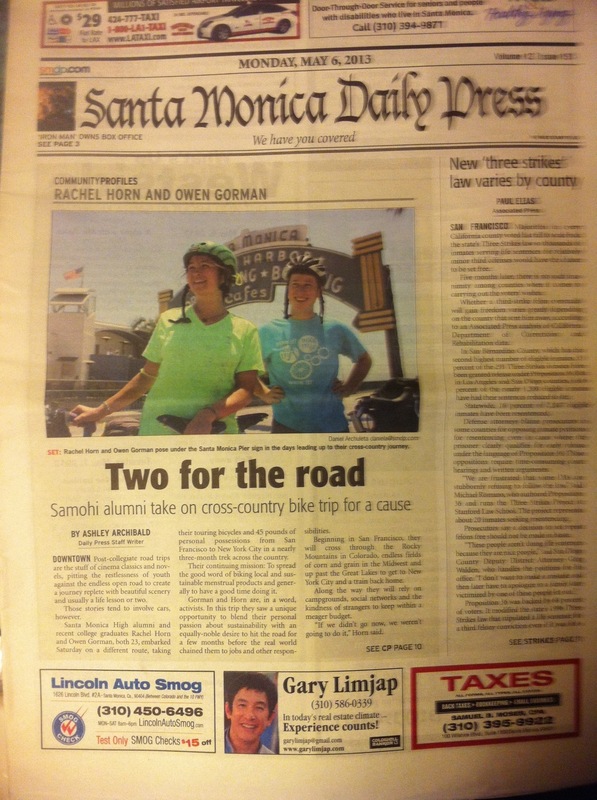 In other exciting news, Owen and I were in the Santa Monica Daily Press yesterday. I got tired of riding my bike. So I found this pony. Day one was yesterday, and was pretty awesome. 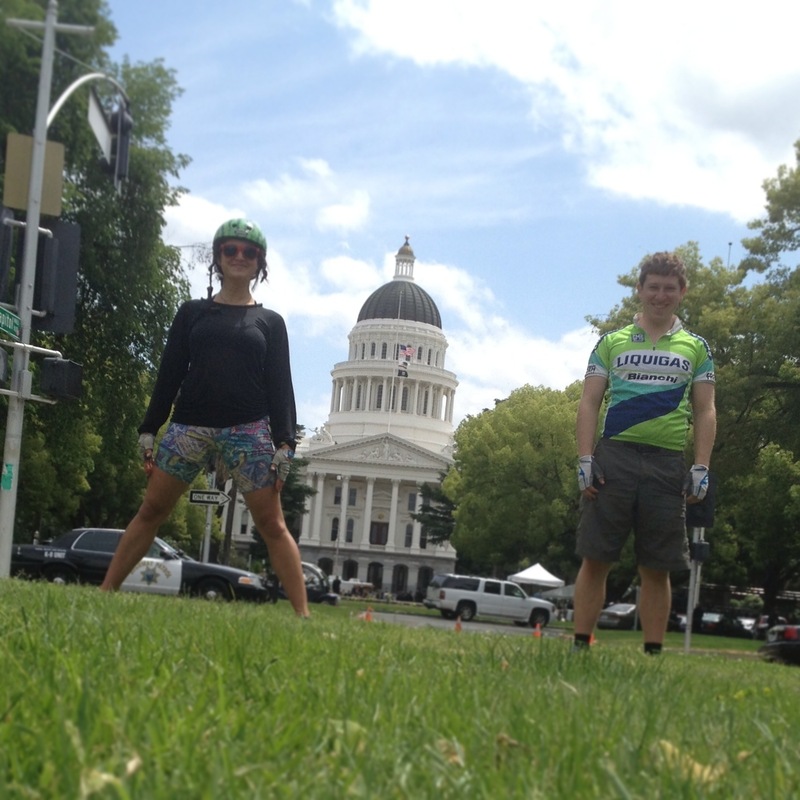 We took BART (public transit) from Oakland to Concord, and biked 63 miles to Davis. It was smooth riding the whole way–with bike paths and bike lanes, a flat landscape, sunny weather, and a nice ciesta in the afternoon at a park in Dixon. A nice 6 hours of riding, and we’re not too sore today. 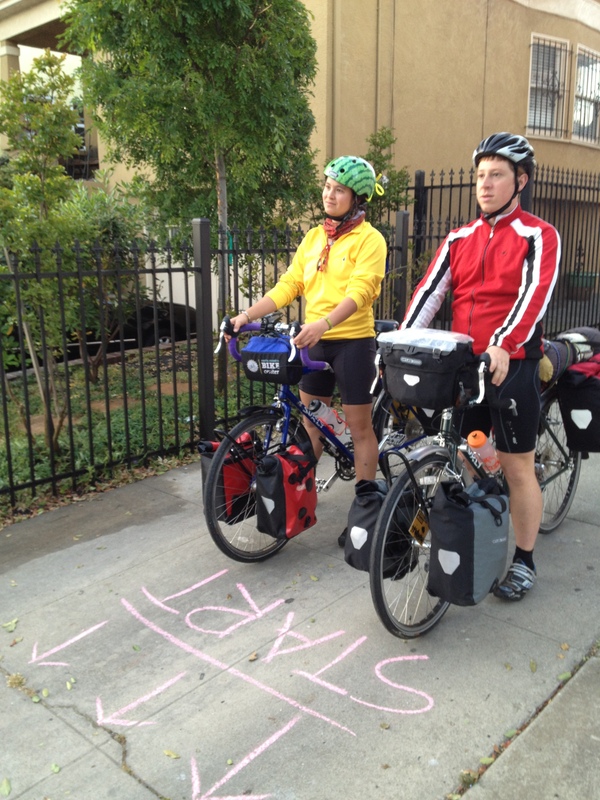 Owen and I are staying with my friend near downtown Davis–which is such a bike friendly place!! Bike paths everywhere, bike parking everywhere, bike tunnels, nice roads, and even a “press for green light” button at some intersections. Pretty awesome. Owen and I are very stoked! And we are settling in to our new lifestyle very nicely. Dipping our back tires into the Pacific Ocean at the Emeryville marina. That’s SF in the back. Just look at that smoothness! Great roads the whole way. A garden work party at my friend’s co op. (I’m sitting in their living room right now). On the Sustainable Cycles front, I have gotten some great responses from people I’ve been talking to. 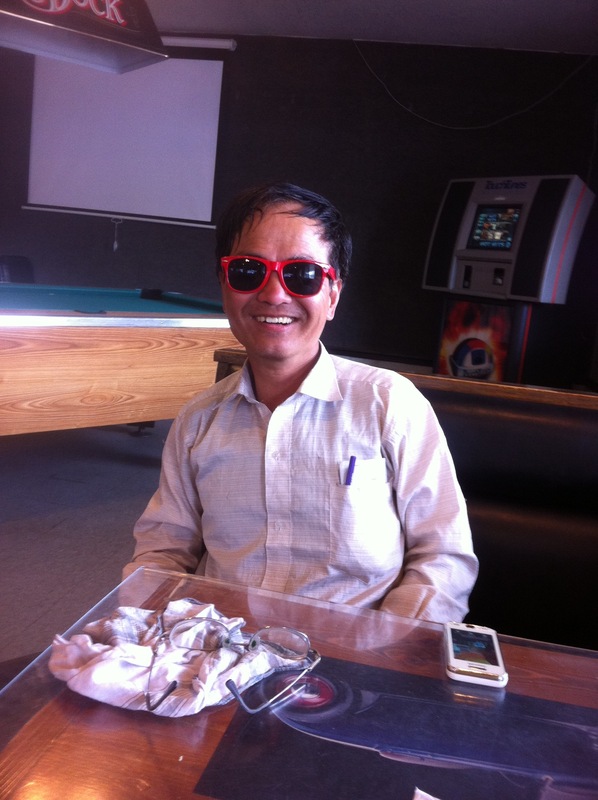 Many of them already use cups and are really supportive of the project. Others use other methods, but still think what we’re doing is great. 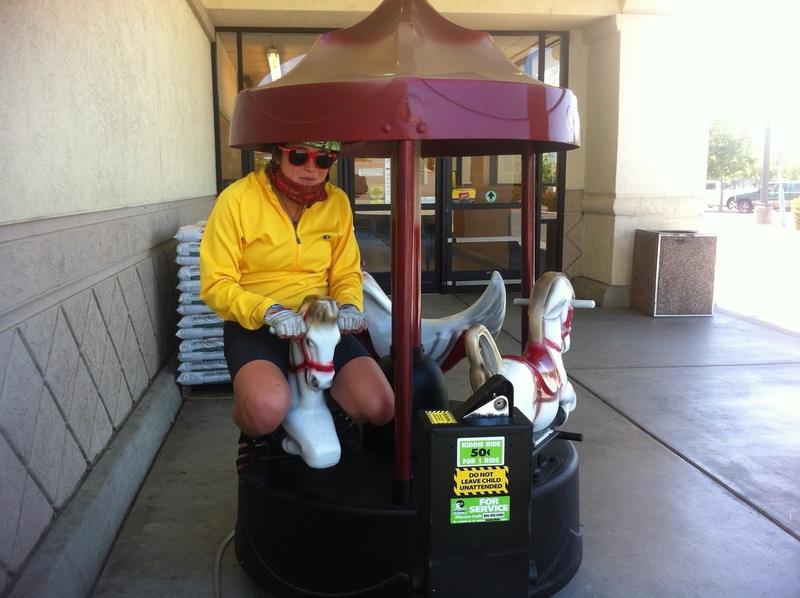 Tomorrow we ride to Sacramento, then to Placerville, then Kirkwood, and onward! Check out an article about us on the LA Streets Blog, oh yeah. Hey hey from the SF Bay! Owen had a slight and unexpected health issue pop up, so he has a Dr.’s appt. this week. That pushes our departure date from April 28 to May 4. Cross your fingers that we are healthy and able to start our ride! The first couple of workshops were awesome. At the Berkeley Free Clinic, we had a great and informative discussion with clinic volunteers and community members. At the California Student Sustainability Coalition (CSSC) convergence at UC Berkeley, Owen and I had about 40 young dreamers attend our workshop–very exciting! Also, I had the opportunity to check out the Women’s Community Clinic in SF, which is an awesome organization that provides health care for all sorts of women in the area. It’s exciting, it’s happening, it’s great. Since Toni last wrote, MUCH has happened. 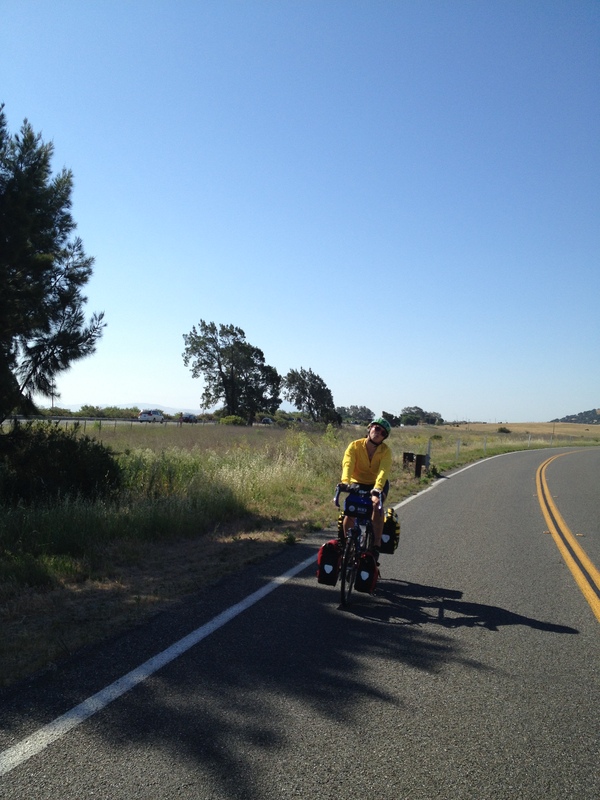 I am riding SF to NYC with my good friend, Owen Gorman, an incredible young man who’s doing a bicycle advocacy project of his own–raising awareness about the Safe Routes to School Program. Check his project out, too. We are geared up, our route is planned, and we’ve been doing some training here in Los Angeles, including two fully-loaded over-nighters. The gear: This is Owen’s list. Mine includes ~30 menstrual cups generously donated by DivaCup (figure courtesy of Owen Gorman). 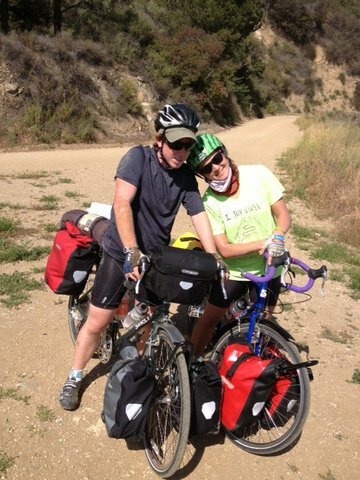 Owen and I on a training ride to Henninger Flats–including a 1400 ft climb over 3 miles. (Photo credit: Kent Strumpell). As you may deduce from the fact that all the computer images are made by Owen, I am what some might call “technologically challenged” as in, I don’t fully understand what a hashtag is, and I’m still figuring out how the heck Twitter works. But! Alas, given that I am jazzed, stoked, and pumped about doing this project across the country, I am putting effort into entering the 21st century…check out the Twitter account I made! We will be ‘tweet tweeting’ along the way. Sustainable Cycles has got a couple of events already planned! Friday, April 26. 6:30 to 8:30 pm at the Berkeley Free Clinic: Sustainable Cycles 101: shifting gears from single-use menstrual products. 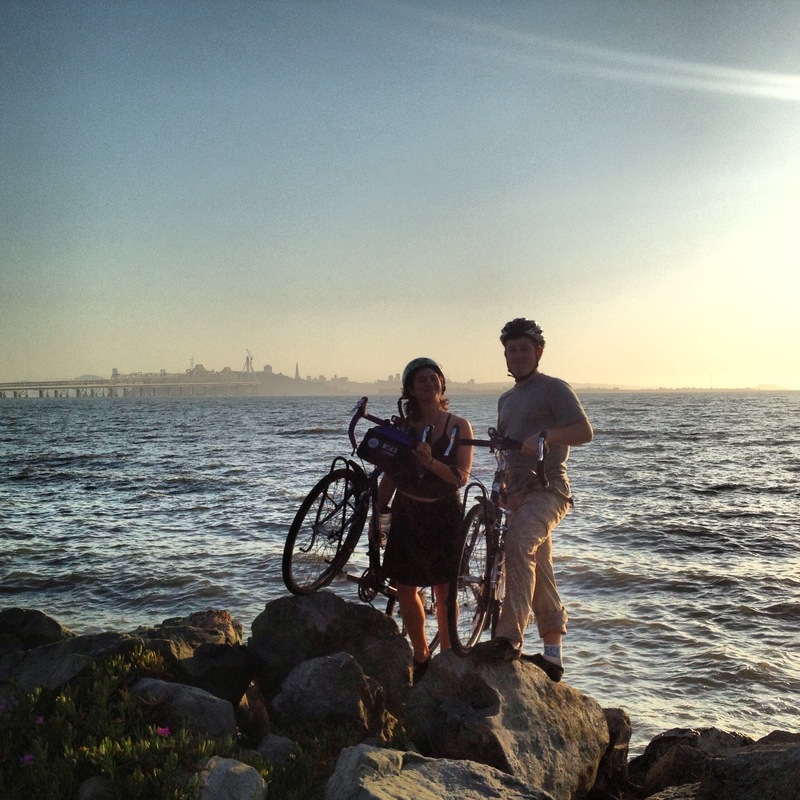 Friday, April 26 at party o’clock in Emeryville: Owen and Rachel’s Bike Eleganza Extravaganza. i.e. Our goodbye party! As it’s at the residence of a friend, please email for details: sustainablecycles101@gmail.com. Fundraising wise, the cup is more than half full! (pun absolutely intended). With a goal of $2000, we’ve raised $1600! Thank you to all those who have contributed! Owen and Rachel drive to SF on Tuesday (4/23). Owen and Rachel DAY 1 to Davis: Sunday (4/28). We are pumped, we are excited, we are enjoying our beds for the last few nights! Over and out. 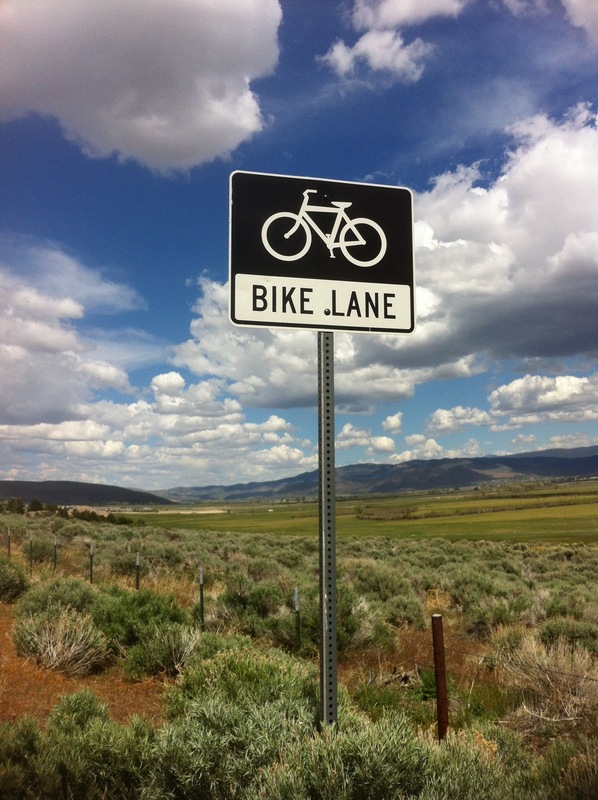 Sustainable Cycles is off to an incredible start in 2013! We were awarded the year-long Lead Now Fellowship; we are presenting at the Society for Menstrual Cycle Research Conference this June; and we are sending Spokeswomen on a trip from the Bay Area to New York City – 3,250 miles! 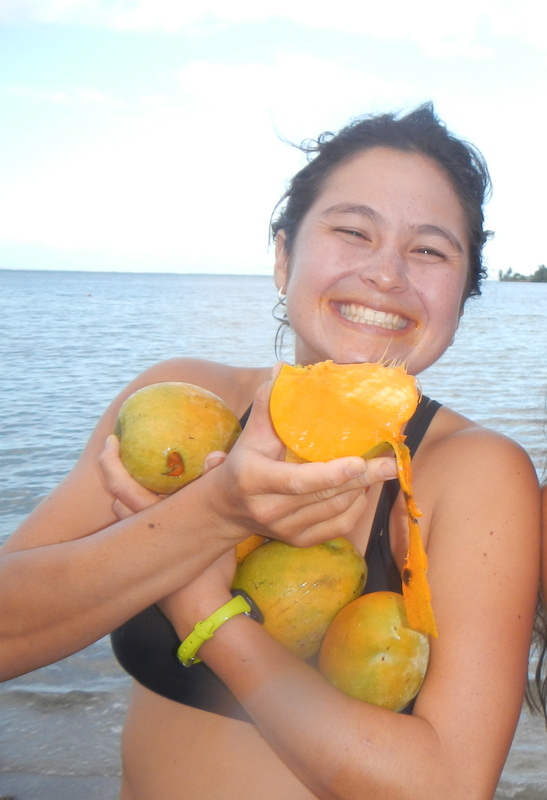 Our 2013 trip will be led by Rachel Horn, a recent graduate of UC Berkeley (read more about Rachel in her bio on our “About” page). The trip begins April 28th in the Bay Area and will take about three months. Passionate Spokeswomen are invited to come along for either the entire trip or a short leg. Please email Rachel directly if you are interested in joining up! Like our previous trip, menstrual cup companies are donating cups for us to give away. Spokeswomen will write blog posts and articles, do interviews, give workshops, and make a ruckus to raise awareness about sustainable menstrual products. Donate now to Rachel’s trip! Her total budget for the 3 month trip (including food, bike repair, sleeping arrangements, a train ticket back to California, everything) is $2,000. We run on a tight (practically non-existent) budget and we are proud of it! 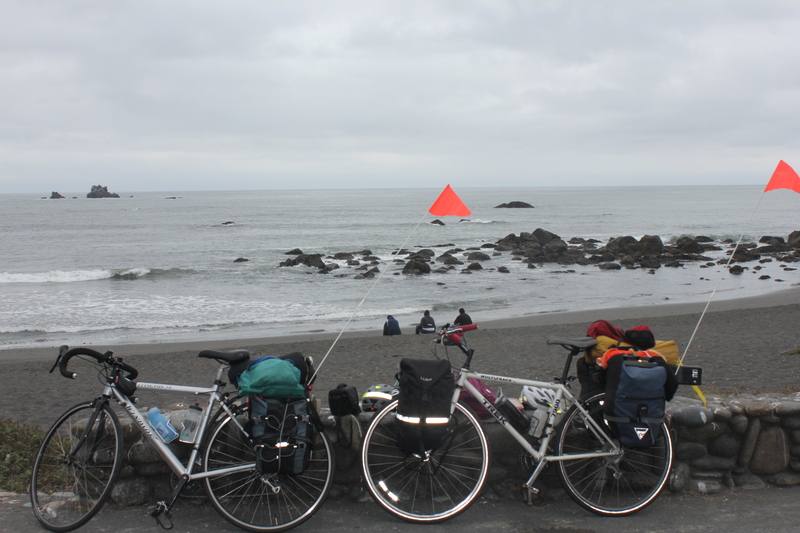 On our last bike trip we spent just $1,400, while giving away 200 menstrual cups. Within a year of use the cups we gave away will save our giftees $9,600 (considering that most women spend $4/month on throw-away supplies). Since the cups last 10 years, those cups will save our giftees $96,000 dollars! Think about it – with an investment of $1,400, Sustainable Cycles saved women $96,000 – that is $68 dollars of value for every $1 invested. 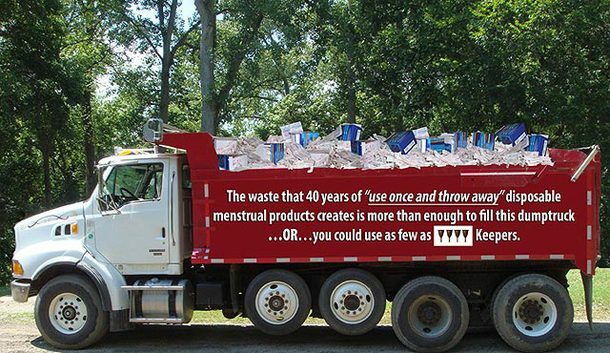 Of course it’s not just about money – those cups are also reducing waste, and benefiting women’s health. It’s a great investment – donate to keep this incredible project going strong!